Pain in the hollow of the knee and behind the knee, respectively, is mostly caused by tensed muscles and trigger points in areas of the calf, knee and the back of the thigh. Fortunately, serious injuries are rarely the cause, especially if there is no known trauma or injury. Even when there is structural wear and tear, such as damaged cartilage etc., knee pain can often be alleviated by getting rid of excessive muscle tension and sometimes even eliminated. In the next chapter, I will lead you step by step through a self-massage of the muscles often responsible for knee pain. Follow these instructions and chances are good that your knee will feel better. 1.1 Why should you massage yourself? Trigger points and muscle tension don’t just disappear “by themselves.” It’s just the opposite. If they’re not treated, they will stay for a long time and can cause problems that are more or less severe – in this case it concerns pain behind the knee. You can, however, “massage” the trigger points out of your muscles and normalise the tension in them. The only thing you have to do is show your nervous system where there is too much tension. You do this by applying pressure to the areas in question. This will lead to the reduction of tension and alleviate your pain—provided, of course, you do the massage regularly! It’s not as complicated as it may sound. Just try it out. First, a bit of information about your massage to make sure you get results. Massage yourself daily, until your pain is gone completely. Focus exclusively on the painful spots in your muscles. Don’t work on the surrounding tissue. If the massage is too painful, simply apply less pressure. On the pain scale from 1 to 10, you should be situated between 4 and 7. Here, we’re dealing with muscles, which, for nearly every person with pain in the hollow of the knee, have tension and trigger points. For this massage, I recommend you use a foam roller or your thumbs. The massage can bring on symptoms similar to that of sore muscles – especially when you have just started. This is normal for this region and goes away quickly. Stimulating the circulation in your legs by walking on level ground will help. For this massage, I recommend you use the thumb technique. 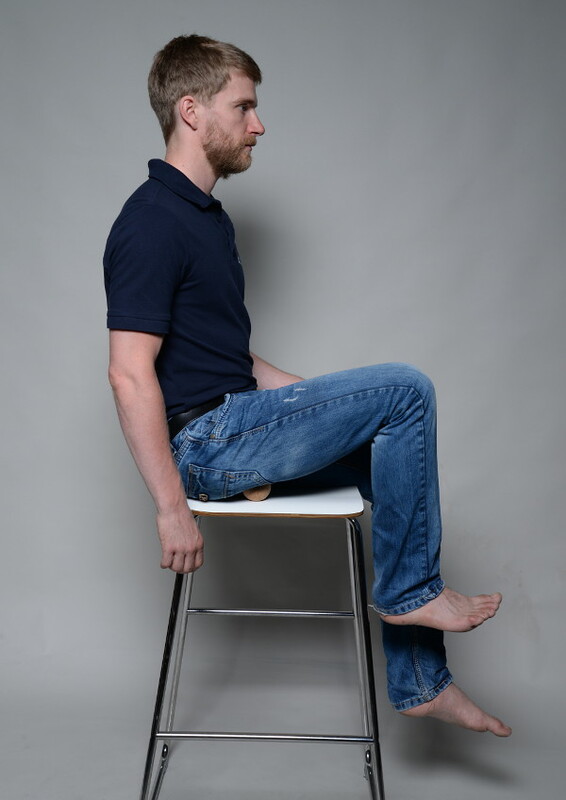 Sit down on a chair with your foot flat on the floor and press into the muscles on the side of the calf – the inner side as well as the outer – and search for painful areas. As soon as you find one, massage over it no more than 15 times from the bottom upward. The picture to your right will help you find these areas. Should you have any difficulties, please refer to my video above. These muscles are primarily responsible for pain behind the knee when extending the knee – the popliteus – and when going downhill, walking and climbing stairs – the plantaris & soleus. Grasp your lower leg with both hands placing your thumbs on top of one another on the backside of your calf. Press into the muscle and search for tense as well as painful locations. As soon as you find one, massage over it very slowly, 15 times at most, from the bottom upward. Generally speaking, the tension in the muscle will gradually subside. Should you run into a particularly stubborn spot, leave it alone for the time being. Search around it for other painful spots, concentrate on those, then go back to the previous spot. It will usually respond better to the massage afterwards. Proceed as described, covering the entire area of the upper-middle calf and the hollow of your knee. Please be patient and cautious and your muscles will eventually relax. You might have to repeat the massage over days or weeks for the muscle to slowly but surely relax and the trigger points to disappear. The massage with a foam roller is much less precise than with your hands, but still very effective. The reason for this is that you can work with a lot of pressure. Sit on the floor and place your calf on the foam roller. Now lift yourself off the floor with your hands, roll your calf slowly over the roller, searching for painful spots. Divide the area of your calf into four sections and massage these areas with short, slow rolling motions. The upper half of your calf is of primary interest to you here. For a more intense massage, cross your other leg over the leg you are massaging. Your hamstring muscle, whose function is to bend the knee and straighten the hip, is found in the back of your thigh. Tension and trigger points in the hamstring muscles often lead to pain in the hollow of the knee when walking or sitting. This muscle group is best massaged with the pressure-motion technique. The massage tool I recommend is the massage ball. Sit on a chair and place the ball under your thigh. Extend and bend your knee a few times. Make sure to extend your knee as far as it will go. Your hamstring does the work here and allowing you to feel any tensed and painful areas in the muscles as soon as they “slide” over the ball. When you find a sensitive spot, move your knee approximately 20 times through the painful section of the motion. Here, the ball is placed near my ischium (the sit bone). The extending and bending of the knee massages the muscles. Apply this procedure for each tensed area in the back of your thigh. To do this, you will have to reposition the ball multiple times. Tension is often located on the outer side of the back of the thigh as well as near the ischium – see images. Keep your massage short at first, and pay attention to how your body responds. The mechanical stress of sitting on a ball should not be underestimated.